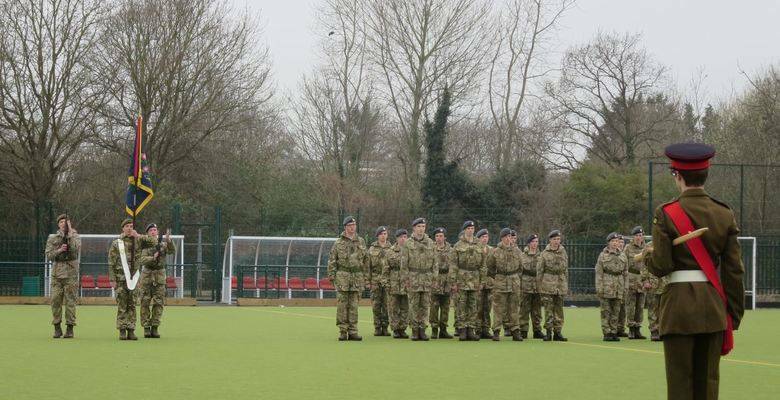 ​The celebrations of 100 years of the CCF began on Thursday 19th March with the biennial inspection at Ditton Field. The Review was followed two days later by the Centenary Dinner, a grand black-tie event organised in collaboration with KGS Friends. Despite the cold weather, a good crowd of parents, alumni, staff and governors gathered to enjoy a range of displays and activities. These began with a parade, followed by stands dotted around the field where cadets could demonstrate and explain the various activities the contingent is involved in, such as living in the field , including the preparation of rations (the latter a mixed delight, we were told), skill at arms and equipment (very impressive), field craft (spotting the carefully hidden cadets and tell-tale items of kit that might give away their presence taxed the most eagle-eyed visitors) and a computer-based flight simulator (the crashing of which proved hard to avoid – or perhaps resist). The Review was followed two days later by the Centenary Dinner, a grand black-tie event organised in collaboration with KGS Friends. Current staff and cadets were joined by members of The Princess of Wales’s Royal Regiment, with whom the contingent is affiliated, and some 60 Old Kingstonians, who proved themselves to be in fine voice and high spirits, and a very enjoyable evening was, it is fair to say, had by all. Lt-Gen Riley was the guest speaker, and in his address he recalled the highlights of the last hundred years, its successes (the Queen’s visit in 1961, the successful military careers of so many alumni) and its disasters (such as the fire in the armoury, a wooden building where the fire-power of a small third-world country, including mortars and anti-tank weapons, was stored, much to the alarm of the fire brigade who had to tackle the blaze), its camps (the first in 1916, when ‘the weather was sweltering and the food left much to be desired’), field days and night exercises, and many of the characters who had served the contingent with such selfless distinction and who illuminated its history. Much had changed, but the values the CCF represented remained – the self-confidence, sense of responsibility and qualities of leadership it instilled in cadets, the commitment to duty and service it fostered and the fundamental decencies it taught. Lt-General Riley closed with a toast – to the next hundred years. After the formalities, the guests lingered and swapped reminiscences and tales, which grew ever taller as the evening went on, before many departed to continue their recollections elsewhere. Our thanks to alumni officer Katie Raymond, the catering staff and the cadets and officers of the CCF for laying on such a splendid celebration of this historic milestone.